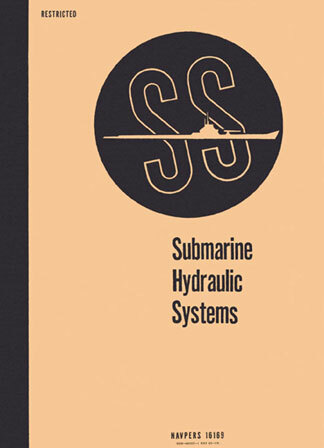 Submarine Hydraulic Installations, Navpers 16169, is one of a series of submarine training manuals that was completed just after WW II. The series describes the peak of WW II US submarine technology. This manual, prepared at the Submarine School, New London, Connecticut, is designed for use in both instruction and servicing. It includes complete descriptions of most submarine hydraulic systems of both Portsmouth and Electric Boat Company design as well as discussions of their operating principles and a detailed description of the operation, installation, and repair of each part. Trouble shooting is presented as a separate chapter, outlining in chart form, troubles, causes, and remedies. Step-by-step work sheets, or job analyses, are included by systems for the more common inspection, service, and repair routines. Free use is made of cutaway and schematic drawings to define operating principles and maintenance procedures. It is recognized that equipment design is subject to change as new requirements are taken into account, and as recommendations of the forces afloat are acted upon. Consequently, the descriptions and discussions included must be considered as generally typical rather than as final and specific in all details.